Just over 4 hours till #Stoptober starts. Have you taken the pledge? We all know about the dangers of smoking, but anyone who has given up will know just how hard it is to do. Last Stoptober over 160,000 people stopped smoking for 28 days. All the research shows that if you stop for 28 days and you’re five times more likely to stay smokefree. We’re encouraging our staff to take part – will you join us? Monday 30th September 2013 – 5.56pm – Murray MacGregor. A young girl has had a lucky escape after being in collision with a car in Birmingham this afternoon (Monday). 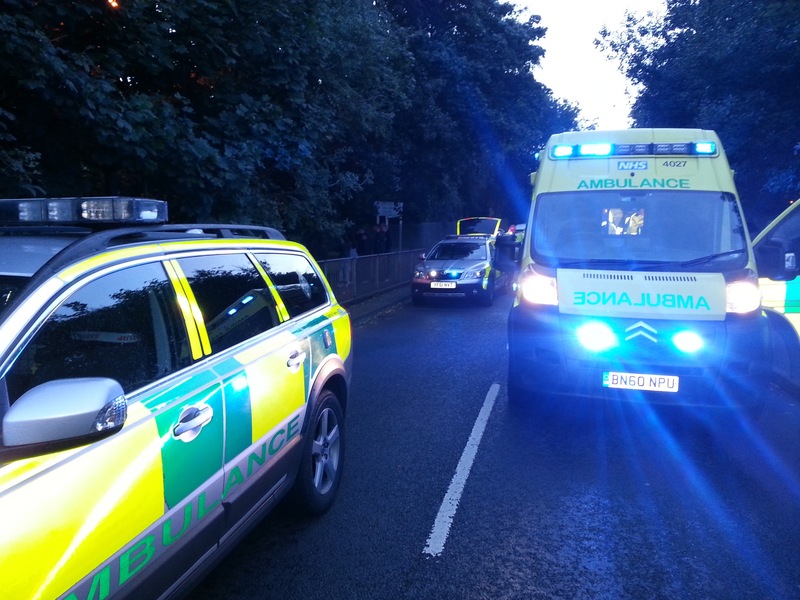 The collision happened on Shenley Lane near the junction of Gregory Avenue and Long Nuke Road at about 4.20pm. An ambulance and a paramedic officer were sent to the scene after no fewer than four 999 calls about the incident. A West Midlands Ambulance Service spokesman said: “Initial descriptions from the callers suggested that the girl could have been seriously injured. “Thankfully, that turned out not to be the case. The 11 year old had suffered multiple bumps and bruises but no obvious injuries of a serious nature. “She was taken to Birmingham Children’s Hospital as a precaution for further assessment, but it is thought likely she will be released later this evening. Monday 30th September 2013 – 4.00pm – Claire Brown. Two men have been injured, one seriously, after being in contact with high voltage power cables in Shropshire. 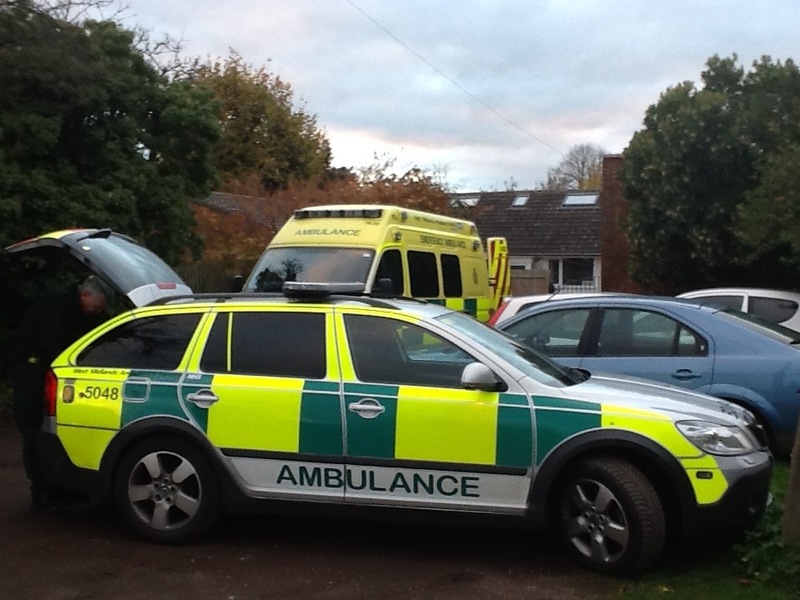 West Midlands Ambulance Service was called to a farm just outside Newport near Chetwynd Aston at around 1.40pm this afternoon (Monday). An ambulance, a senior paramedic officer and the Midlands Air Ambulance from Cosford with a MERIT trauma doctor on board attended the scene. A West Midlands Ambulance Service spokeswoman said: “Crews arrived to find two men who had been injured by electricity cables. 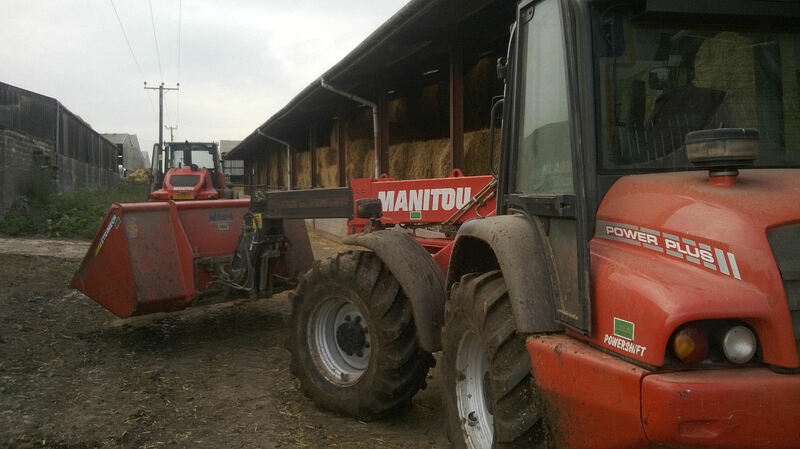 “Crews were told the two men were in a tractor bucket when the tractor made contact with overhead live electricity cables. Both men were initially unconscious immediately after the incident but, upon arrival of crews, the men had regained some level of consciousness but were disoriented and suffering the effects of a significant electric shock. “A 21-year-old man sustained a number of small full thickness burns to his body. Crews and the medic administered pain relief and fluids to the man before he was airlifted to University Hospital North Staffordshire for further emergency treatment. Monday 30th September 2013 – 8am – Chris Kowalik. A number of houses were evacuated in Staffordshire last night after a car collided with a nearby gas main. 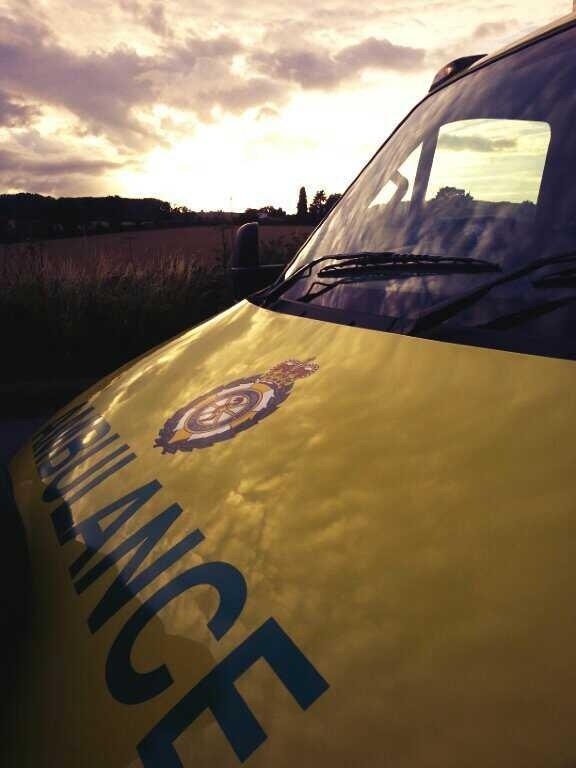 West Midlands Ambulance Service was called to the B5016 in Yoxall shortly before 10.30pm last night (Sunday). A paramedic area support officer in a rapid response vehicle attended along with an ambulance crew. Sunday 29th September 2013 – 9am – Chris Kowalik. 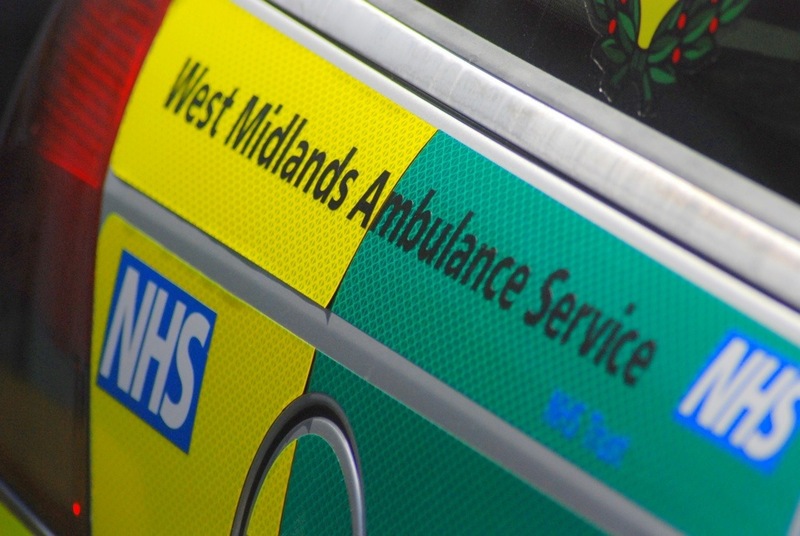 A man has been seriously injured in a road traffic collision in Birmingham. West Midlands Ambulance Service was called to Sycamore Road, Bournville shortly after 2.15am today. A paramedic in a rapid response vehicle, a paramedic area support officer in a rapid response vehicle and the MERIT team of trauma doctor and critical care practitioner in a rapid response vehicle attended along with an ambulance crew. A West Midlands Ambulance Service spokesman said: “Crews arrived to find a car that had overturned and had caught fire. “Two men who had been in the car were both out of the vehicle; the passenger with minor injuries; the driver, a man believed to be in his forties, with serious injuries including a head injury. “Advanced life support for the badly injured man was administered at the scene including the giving of drugs, anaesthetising and maintenance of his airway. A man has died after the car he was driving overturned. West Midlands Ambulance Service was called to Kingsbury Link Trinity Road, Piccadilly, south of Tamworth at 8.30pm last night (Saturday). Saturday 28th September – 7am – Suzie Fothergill. A man has died following an incident in the Black Country yesterday. An ambulance, a paramedic area support officer and the MERIT rapid response vehicle, carrying a critical care paramedic and a trauma doctor were dispatched to the scene. Friday 27th September 2013 – 8.45pm – Suzie Fothergill. 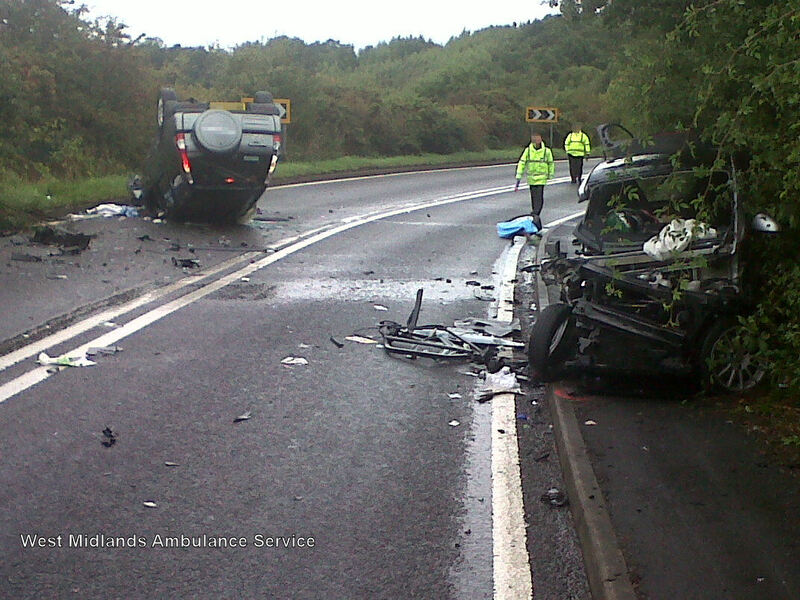 Two people have been taken to hospital following a road traffic collision in Worcestershire. West Midlands Ambulance Service was called to the incident at the junction of the A4104 and Defford Road in Pershore shortly before 5.25pm this afternoon. An ambulance, a rapid response vehicle, a paramedic area support officer, a medical first responder and two Midlands Air Ambulances; one from Cosford and one from Strensham were dispatched to the scene. A West Midlands Ambulance Service spokeswoman said: “Crews were called to reports of a two vehicle road traffic collision. “A woman was found to be trapped in one of the vehicles. She was extricated and treated for multiple injuries. Due to the nature of her injuries she was given an anaesthetic at the scene and fully immobilised before being airlifted to the major trauma centre at Queen Elizabeth Hospital Birmingham. Friday 27th September 2013 – 3.30pm – Steve Parry. Five people have been taken to hospital following a road traffic incident on the M6 in Staffordshire this afternoon. 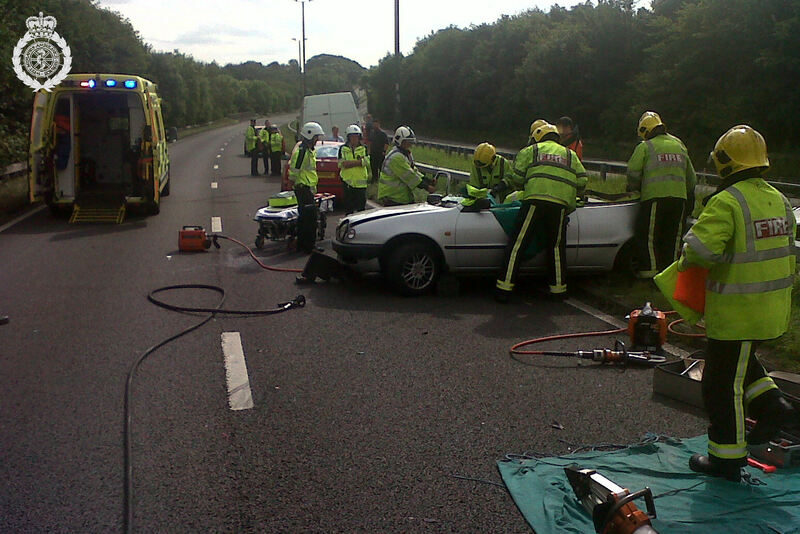 West Midlands Ambulance Service was called to the M6 between junction 13 and 14 just after 1.20pm. An ambulance, a paramedic officer and the Midlands Air Ambulance from Cosford were sent to the scene. A West Midlands Ambulance Service spokesman said: “Ambulance crews responded to a road traffic collision involving a lorry and car. “Three adults and two young children travelling in the car were treated for minor injuries and taken to Stafford Hospital for further assessment and treatment. Friday 27th September 2013 – 7.00am – Suzie Fothergill. A woman has been taken to hospital following an incident in Birmingham last night. West Midlands Ambulance Service was called to The Green in Kings Norton shortly before 9.50pm yesterday. An ambulance, a rapid response vehicle, a paramedic area support officer and the Trust’s MERIT rapid response vehicle, carrying a critical care paramedic and a trauma doctor were dispatched to the scene. A West Midlands Ambulance Service spokeswoman said: “Crews arrived on scene to find a single vehicle that had been in collision with some railings. The car had sustained significant damage and part of the railings were found to have gone through the driver’s side of the windscreen and out through the rear window. Wednesday 25th September 2013 – 8.15pm – Suzie Fothergill. A boy has been airlifted to hospital following a road traffic collision in the Black Country today. West Midlands Ambulance service was called to the incident on Wrens Nest Road in Dudley shortly before 4.55pm this afternoon. An ambulance, a rapid response vehicle, a paramedic area support officer and the Midlands Air Ambulance from Cosford were dispatched to the scene. A West Midlands Ambulance Service spokeswoman said: “Crews were called to reports of a road traffic collision between a bmx bike and a car. The bike was reportedly carrying three boys at the time of the incident. “On arrival at the scene, crews found one of the boys lying in the road with bystanders providing first aid. “The boy, believed to be 13 years of age, was treated for a potentially serious head injury and a laceration to his chin. He was fully immobilised and conveyed in the land ambulance to an awaiting air ambulance, which had landed on a nearby school field. The boy was airlifted to Birmingham Childrens Hospital for further assessment and treatment. “A second boy who had sustained a knee injury was treated and discharged by an advanced paramedic at the scene. Wednesday 25th September 2013 – 4.58pm – Murray MacGregor. 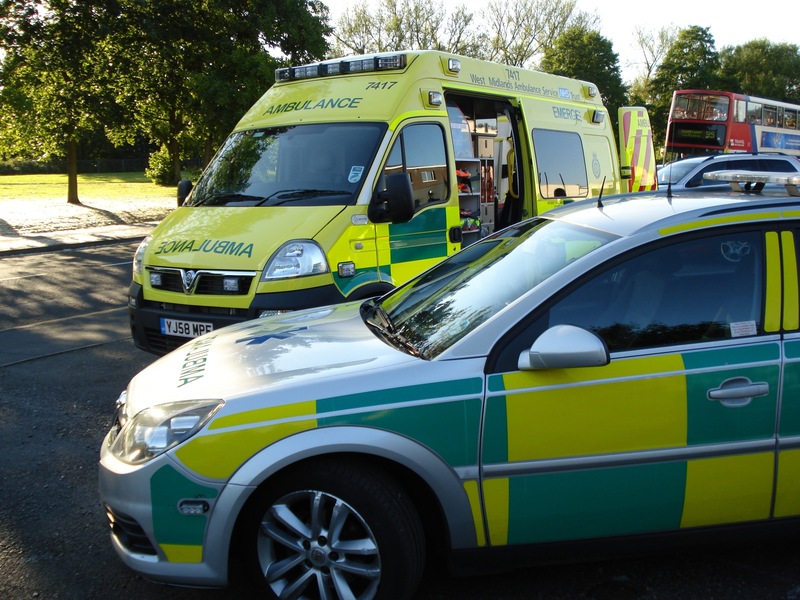 A man has suffered a potentially serious injury after a two car crash in a Warwickshire village. The crash happened at about 2.40pm on Wednesday afternoon in Corley Ash at the junction of Tamworth Road and Highfield Lane outside the Saracens Head pub. A West Midlands Ambulance Service spokesman said: “On arrival, crews found two cars that had been in collision. The first car had damage to the passenger side while the other had significant front end damage. “A Coventry woman in her 20s was in the first car. She had suffered neck and back injuries. She was immobilised using a neck collar and spinal board before being taken to University Hospital Coventry & Warwickshire. Tuesday 24th September 2013 – 9.45pm – Suzie Fothergill. Two people have died following an incident in Staffordshire today. West Midlands Ambulance Service was called to reports of a fire in a residential property on Lichfield Road in Stone shortly after 6.20pm this evening. A rapid response vehicle and a paramedic area support officer were dispatched to the scene. The fire service and the police were also in attendance. A West Midlands Ambulance Service spokeswoman said: “Crews arrived on scene to find firefighters carrying out CPR on two people who had been brought out of a smoke filled property. Tuesday 24th September 2013 – 12.40pm – Claire Brown. A Black Country builder has thanked the ambulance staff for their care after a seven foot wall collapsed on top of him. On the 3rd June Peter Davies, 40 from Brierley Hill, was helping his brother to take down a brick wall in the graveyard of Spring Meadow Church in Old Hill when the wall became unstable and collapsed. Peter was buried face down, underneath a pile of bricks and rubble. An ambulance, a responder paramedic, an area support officer and the Midlands Air Ambulance from Cosford with a MERIT trauma doctor on board came to his aid. Peter sustained a nasty leg fracture and a compression fracture of his spine in the incident. 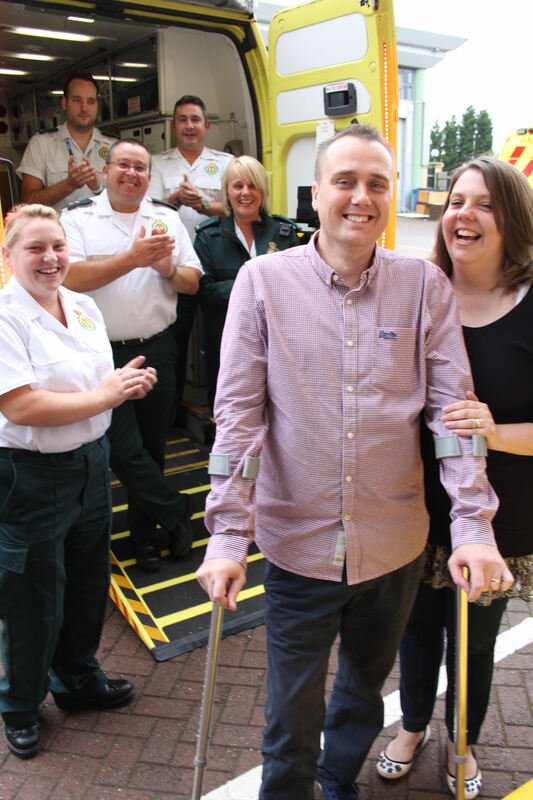 Ambulance crews gave Peter pain relief and oxygen before they got to work on cleaning and dressing his leg wound. Once immobilised onto a neck collar and spinal board Peter was rushed to hospital. Peter, a self-employed builder, spent four weeks at Queen Elizabeth Hospital Birmingham where he underwent surgery on his leg and a further three days at Russells Hall Hospital. 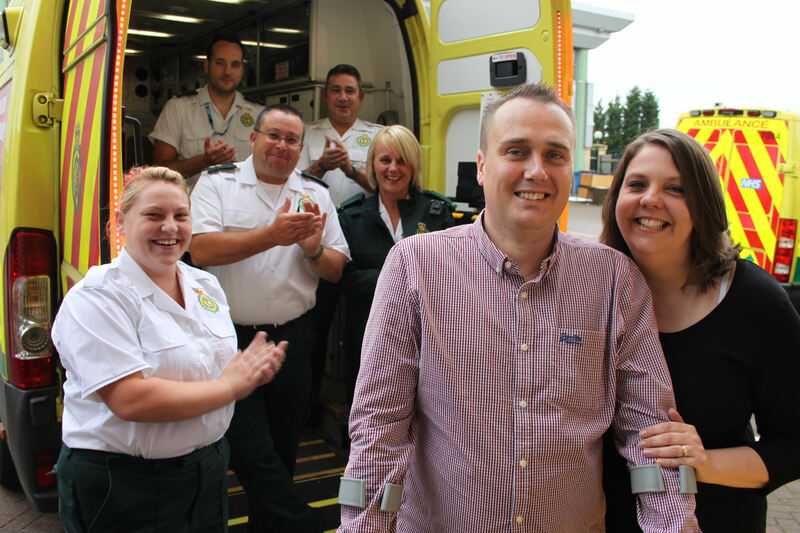 Peter and his wife, Debbie, visited the Trust’s Headquarters in Brierley Hill last week to meet the call taker and ambulance crews that helped that day. Peter said: “I remember the wall falling down, I remember seeing the first paramedic, I remember the people in orange (air ambulance paramedic and doctor) and I remember asking if I was going to die and hearing the answer, ‘no’. That’s about all I can recall. Debbie recalls the moment Peter’s Brother rang her to tell her about the accident: “Peter’s Brother said that he’d been injured at work, the air ambulance was there but told me not to panic…..so I immediately started to panic! When I got there, the ambulance crews were treating Peter and helped to reassure me that he was going to be okay. Peter Boaz, a Birmingham based paramedic, was part of the ambulance crew that attended and said: “It’s humbling to see Peter and Debbie again and for them to take the time to come and thank us in person. Pictured in back of ambulance (left to right): Lucy Beardsmoor (Call Taker), Peter Boaz (Paramedic), Martin Eaton (Area Support Officer), Darren Roberts (Technician), Rachael Watkins (Responder Paramedic), Peter and Debbie Davis. Monday 23rd September 2013 – 11.45pm – Murray MacGregor. 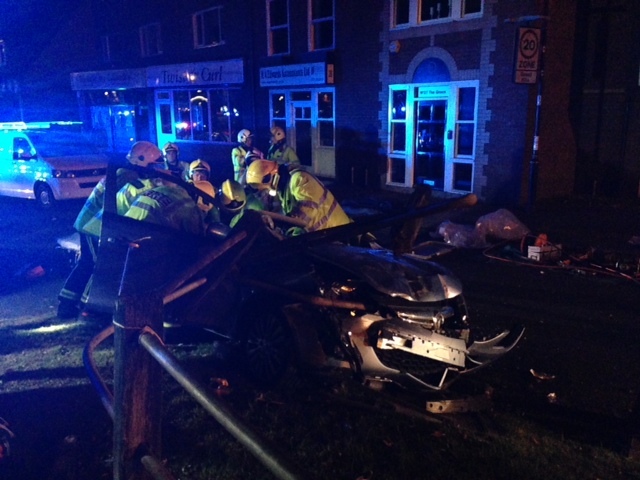 Four people, including a young boy have been taken to hospital after a three car crash in Staffordshire. The crash happened at about 8.20pm on Monday evening outside Hopwas House Farm in Plantation Lane, Hopwas near Tamworth. A total of four ambulances, a paramedic officer, a community first responder and the MERIT Trauma Doctor were sent to the scene. A West Midlands Ambulance Service spokesman said: “All three cars had suffered quite a bit of damage which had left quite a lot of debris on road. The first car, an MG was most badly damaged. The driver, a man in his 30s had suffered a head injury. He was immobilised using a neck collar and spinal board before being taken to Good Hope Hospital. “There were two elderly females in the second car. It had ended up in a hedge. One of the ladies was suffering from neck and shoulder pain. She too was immobilised and taken to the same hospital. There was a family with two young boys in the third car. It had suffered extensive damage to the driver’s side. The man driving had a nasty fracture to his left leg. 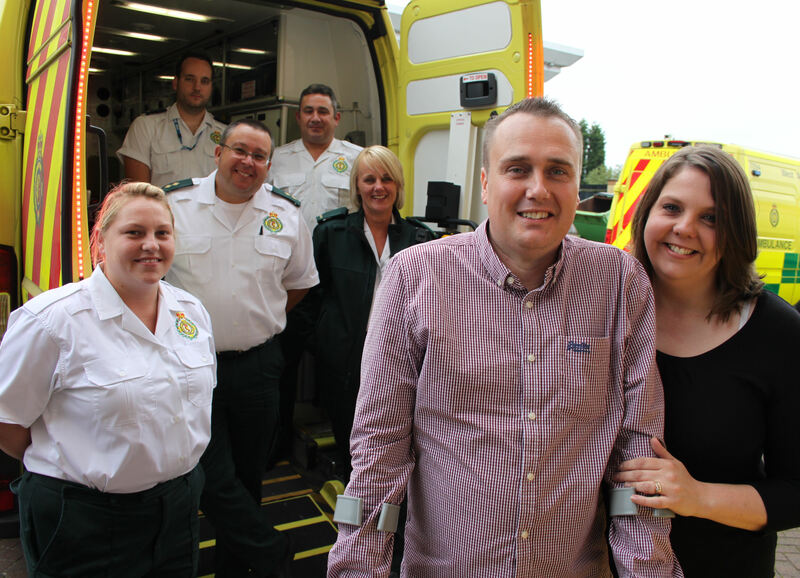 He was given pain relief before being immobilised and taken to Heartlands Hospital as a precaution. Monday 23rd September 2013 – 6.45pm – Murray MacGregor. A man has died following a collision involving a people carrier and a lorry in Coventry. West Midlands Ambulance Service was called to the A46 Eastern bypass near Tollbar Island shortly after 2.35pm today. Two ambulance crews attended along with a paramedic officer and two critical care paramedics from the Warwickshire and Northamptonshire Air Ambulance who were in a response vehicle. A West Midlands Ambulance Service spokesman said: “The people carrier had suffered very significant damage at the front after colliding with a lorry in a layby. Sunday 22nd September 2013 – 10.00pm – Suzie Fothergill. Three people have been taken to hospital following a road traffic collision in Birmingham. 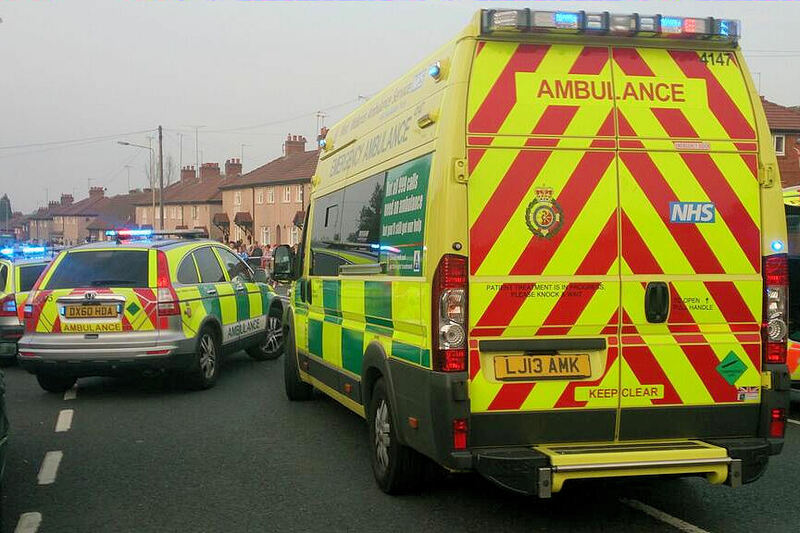 West Midlands Ambulance Service was called to Highgate Middleway in Sparkbrook shortly before 6.25pm this evening. Four ambulances and two ambulance officers were dispatched to the scene. An off duty paramedic, the police and the fire service were also in attendance. A West Midlands Ambulance Service spokeswoman said: “Crews were called to reports of a two car road traffic collision. One of the vehicles was also found to have been in collision with some railings. “The driver of the first car, a man, was seriously injured. Emergency medical treatment was immediately carried out and the man was conveyed to the major trauma centre at Queen Elizabeth Hospital Birmingham. “A child, a boy, from the same car was treated at the scene for minor injuries before being conveyed to Birmingham Children’s Hospital as a precaution. Sunday 22nd September 2013 – 7.00pm – Suzie Fothergill. 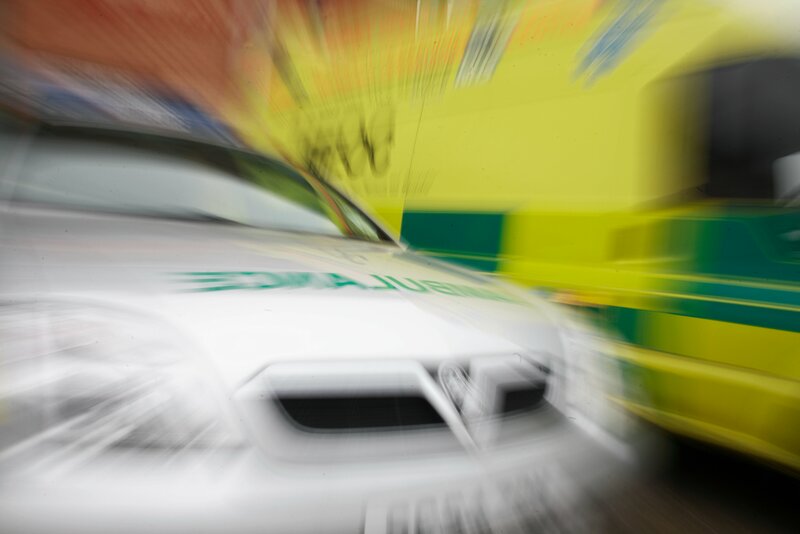 A man has died following a road traffic collision in Birmingham today. West Midlands Ambulance Service was called to the incident at the junction of St. James Road and Wheeleys Lane in Birmingham shortly after 1.05pm today. Two ambulances, a BASICS Doctor and an ambulance officer attended the scene. A West Midlands Ambulance Service spokeswoman said: “Crews were called to reports of a mini bus and a motorcycle that had been in collision. The motorbike had also been in collision with a wall. “The motorcyclist, a man, had suffered serious multiple injuries and was found to be in cardiac arrest. Emergency medical treatment was immediately carried out at the scene. “The man was conveyed to the major trauma centre at Queen Elizabeth Hospital where medics had been pre-alerted and were on standby awaiting the crew’s arrival. Sunday 22nd September 2013 – 6.40pm – Suzie Fothergill. Two pedestrians have been taken to hospital following a road traffic collision in Birmingham today. West Midlands Ambulance Service was called to the incident on Slade Road in Erdington shortly before 11.15am this morning. Two ambulances, a rapid response vehicle and a paramedic area support officer were dispatched to the scene. A West Midlands Ambulance Service spokeswoman said: “On arrival at the scene crews found a van and two pedestrians that had been in collision. “The first pedestrian, a woman in her 80’s, was treated for injuries to her pelvis and head. She was fully immobilised and conveyed to the major trauma centre at Queen Elizabeth Hospital Birmingham. “The second pedestrian, a man of similar age, was treated for pelvic and chest injuries. The man was fully immobilised and conveyed to the same hospital for further assessment and specialist treatment. Sunday 22nd September 2013 – 10.30am – Suzie Fothergill. 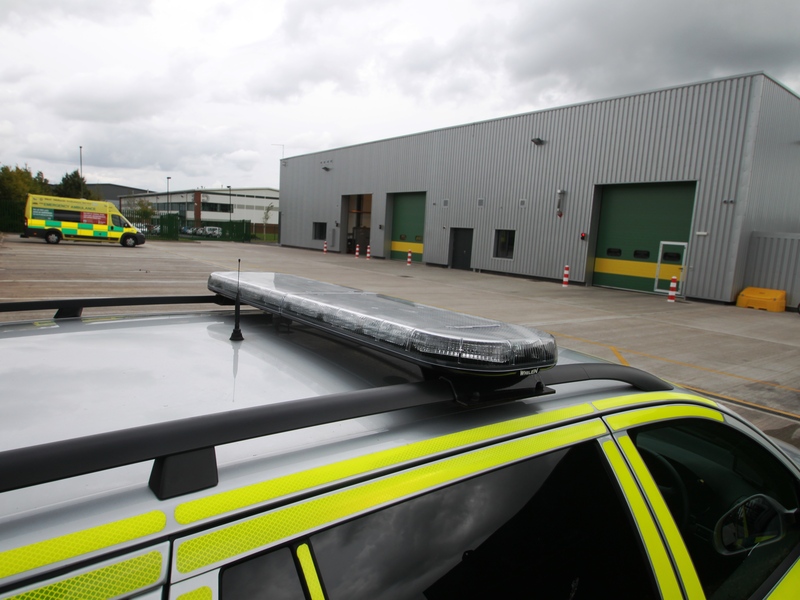 A man has been treated by ambulance crews following an incident in Staffordshire today. West Midlands Ambulance Service was called to Uttoxeter Road in Blithbury, Rugeley shortly after 3.10am. An ambulance, a rapid response vehicle, a paramedic area support officer and the Trust’s MERIT rapid response vehicle, carrying a critical care paramedic and a trauma doctor were sent to the scene. A West Midlands Ambulance Service spokeswoman said: “Crews were called to reports of a man who had fallen from his pushbike. A man has been injured following an incident in Worcestershire today. 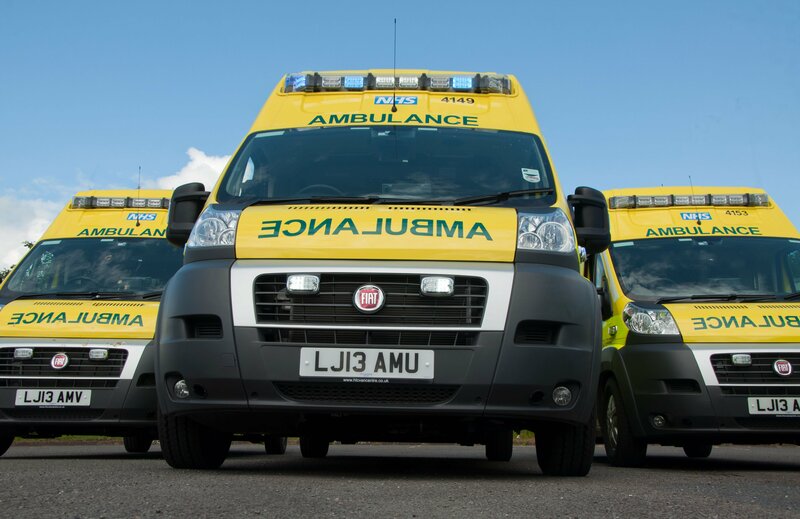 West Midlands Ambulance Service was called to reports of a man who had fallen out of a tree in a wooded area near to Sherridge Road in Leigh Sinton shortly after 1.20am this morning. A West Midlands Ambulance Service spokeswoman said: “On arrival at the scene crews found a group of campers, down a steep embankment and near to a wooded area approximately 70 metres from the road. “One of the campers, a man, had reportedly fallen approximately 30 feet from a tree. Due to the location of the incident and the limited light available, crews carried out an initial assessment at the scene, treating the man for a potential spinal injury and chest pain. “The man was fully immobilised and carefully carried back to the awaiting ambulance where crews carried out further assessment. “The man was treated at the scene for a collapsed lung before being conveyed to the major trauma centre at Queen Elizabeth Hospital for further assessment and treatment. A man has been taken to hospital following a flat fire in Birmingham today. West Midlands Ambulance Service was called to the incident on Park Lane in Aston shortly after 1.40am this morning. Two ambulances, a paramedic area support officer and the Hazardous Area Response Team (HART) were dispatched to the scene. The fire service were also in attendance. A West Midlands Ambulance Service spokeswoman said: “Approximately 30 people were evacuated from the building. “One man was rescued from the flat and was treated for burns to his back and limbs before being conveyed to the specialist burns unit at Queen Elizabeth Hospital Birmingham for further assessment and treatment. Friday 20th September 2013 – 3.00pm – Suzie Fothergill. 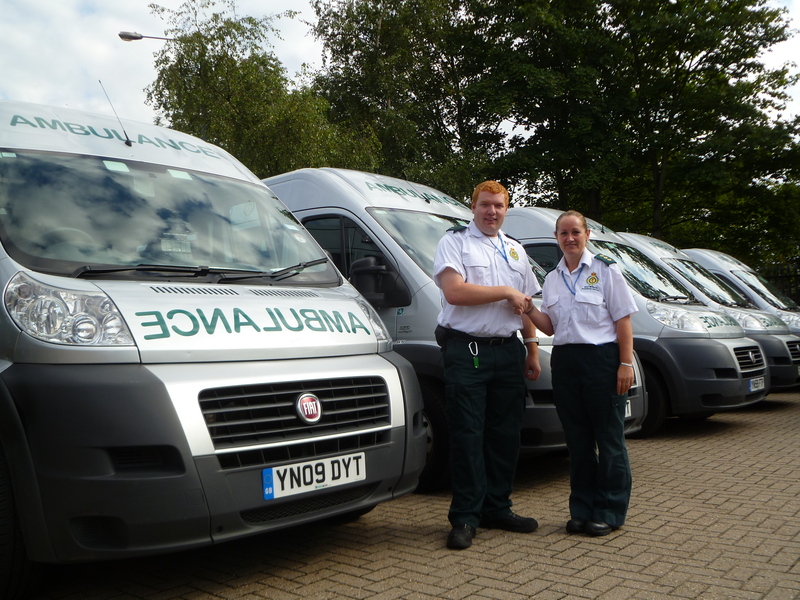 Following a 12 month programme West Midlands Ambulance Service’s very first Patient Transport Service Apprentice has now been hired! Twenty-two year old Scott Kenzie from Coventry started his apprenticeship with the Trust in August 2012, as part of a scheme in partnership with Performance Through People. One year on and Scott has now successfully passed his intermediate level apprenticeship in Health (Healthcare Support Services) and has been offered a full time permanent position within the Patient Transport Services Team in Coventry. Talking about the scheme Scott said: “The apprenticeship provided a great opportunity to gain a qualification, whilst providing invaluable on the job experience. Susan McLeod, PTS Contract Manager for Coventry and Warwickshire said: “The apprenticeship programme is a fantastic way of welcoming aspiring young people into the Trust. It’s great news that Scott has managed to secure a full time permanent position. After working within PTS for 12 months he is already very much part of the team. Scott has always had an interest in healthcare and prior to taking on the apprenticeship he worked for St John Ambulance Service. Alongside his new PTS position, Scott has now also applied to become a volunteer Community First Responder for the Trust in his spare time. Rob Colbourne, Managing Director of Performance Through People (PTP) who manage the Apprenticeship programme for WMAS said: “PTP are proud to be associated with the West Midlands Ambulance Service and are grateful for the support and commitment from the Senior Managers to ensure quality time is given to their staff to work towards completing their Apprenticeship. 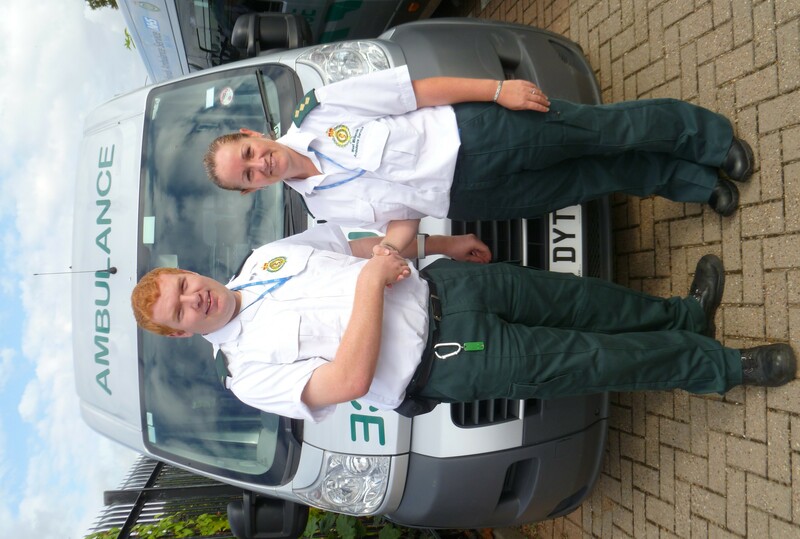 If you are interested in joining the Trust as an apprentice, you can find out more by going to http://www.jobs.nhs.uk and searching for West Midlands Ambulance Service within the employer search box. Pictured: Scott Kenzie and Susan McLeod. Friday 20th September 2013 – 12.15pm – Steve Parry. A man has died in a road traffic collision on the M6 earlier this morning. 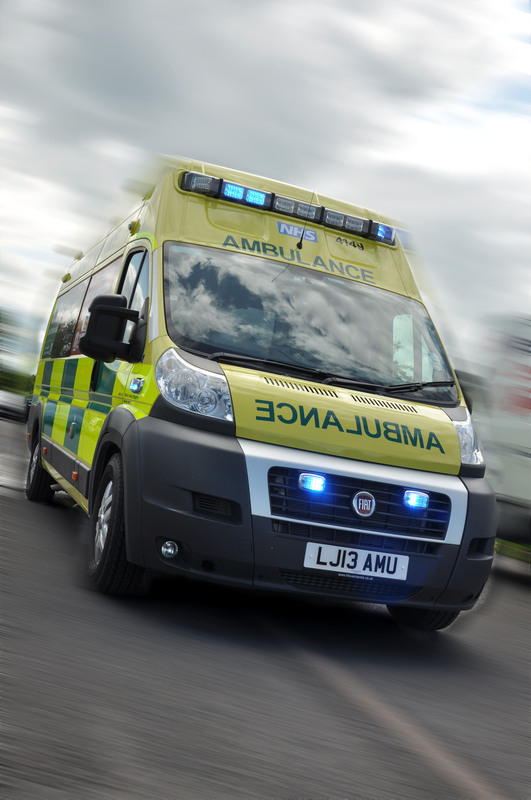 West Midlands Ambulance Service was called to the M6 southbound between junctions 16–15 at approximately 7am. An ambulance together with a paramedic in a rapid response vehicle; a paramedic officer and BASICS doctor attended the scene. A West Midlands Ambulance Service spokesman said: “Crews attended a road traffic collision on the M6 this morning. Wednesday 18th September 2013 – 7.00pm – Murray MacGregor. Every organisation needs to develop if it is to grow and prosper. The key to that process is to help the most important part of your organisation; your staff, to do the growing so that they can make the difference. For an organisation like West Midlands Ambulance Service, this is especially true because by developing our staff, we improve the level of patient care and safety which ultimately could have a lifesaving consequence. This Thursday (19th September), we will be running our second Organisational Development Conference for many of our staff who are ‘growing’ in their roles, skills and leadership. Barbara Kozlowska, Head of Organisational Development, said: “The Trust’s vision is designed to enable us to become even more successful than we already are. It describes how we will ensure the culture, capacity and capability of our staff will allow us to take the way we care and treat patients to the next level, for example treating more patients at the scene, reducing the number that need to go to hospital and the care they experience is of the highest possible standard. In addition, those attending will get a chance to take part in a series of workshops to give them new ideas and skills in communicating more effectively and explore actions to encourage innovation. The event takes place at The Public in West Bromwich between 9.00am and 3.00pm. Wednesday 18th September 2013 – 4.45pm – Suzie Fothergill. 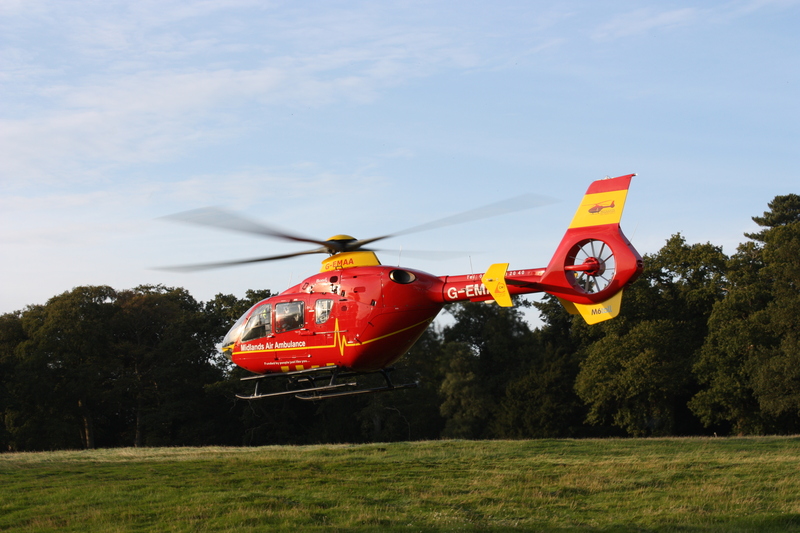 A man has been airlifted to hospital following an incident in Worcestershire today. West Midlands Ambulance Service was called to the A456 in Rock, Clows Top shortly after 1.30pm this afternoon. An ambulance and two Midlands Air Ambulances; one from Strensham and one from Cosford were dispatched to the scene. A West Midlands Ambulance Service spokeswoman said: “Crews were called to reports of a man who had fallen from a quad bike. “The man, who was not wearing a helmet, had suffered a serious head injury. Due to the nature of his injury, the man was given an anaesthetic at the scene and was fully immobilised before being airlifted to the major trauma centre at Queen Elizabeth Hospital for further assessment and specialist treatment. Wednesday 18th September 2013 – 1.00pm – Suzie Fothergill. 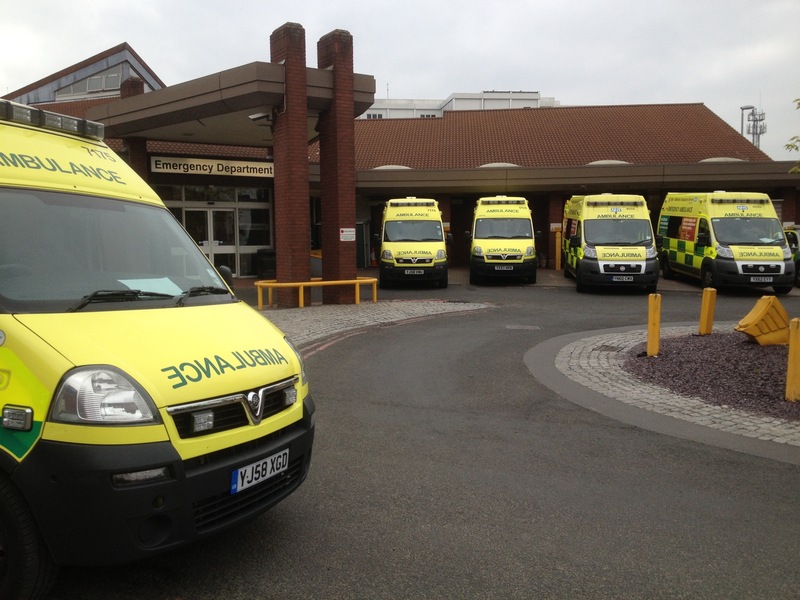 A six year old girl has been treated by ambulance crews following an incident in Staffordshire today. West Midlands Ambulance Service was called to Horninglow Street in Burton on Trent shortly before 7.55am this morning. An ambulance, a rapid response vehicle and the Midlands Air Ambulance from Staffordshire were dispatched to the scene. 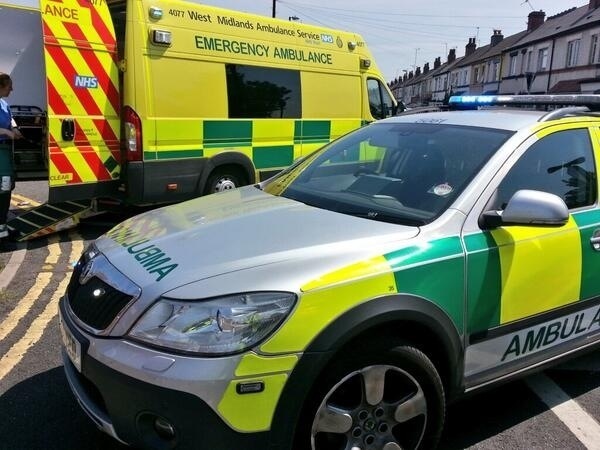 A West Midlands Ambulance Service spokeswoman said: “On arrival at the scene crews found a girl whose ankle had become trapped in the wheel of a bicycle after she had reportedly fallen from it. Congratulations to Sir Bradley Wiggins who will be wearing the prestigious Gold Jersey for the 2013 Tour of Britain when it leaves Stoke on Trent tomorrow morning. 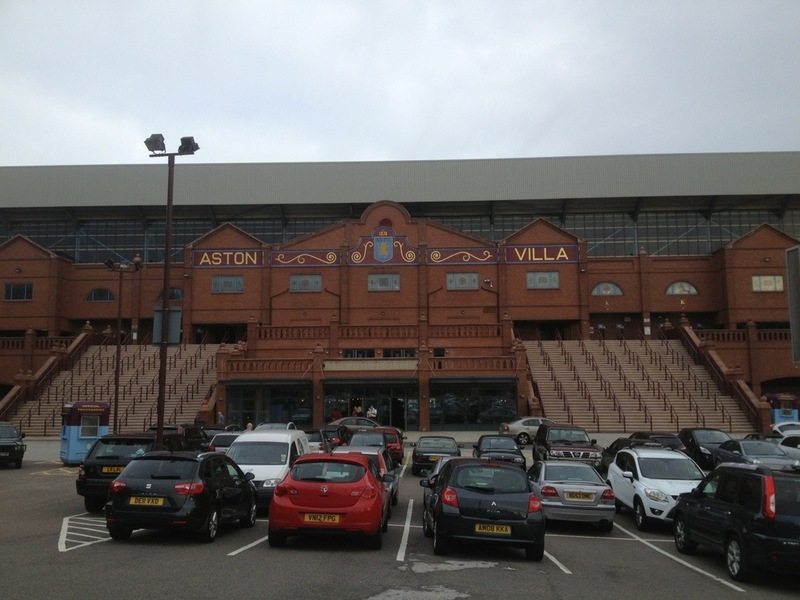 It is the fifth time the Potteries has hosted the event. 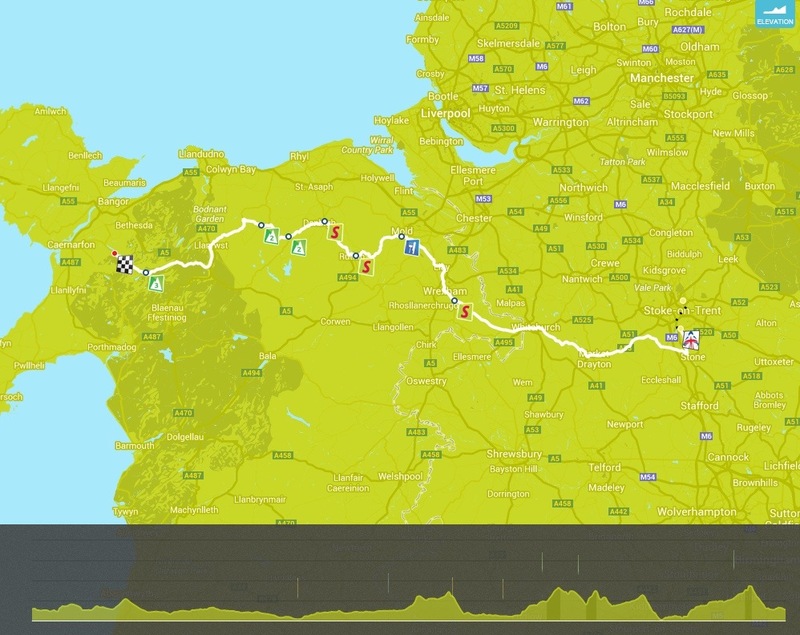 Stage 4 runs from Stoke to Llanberis in Snowdonia in a 188.4km stage. 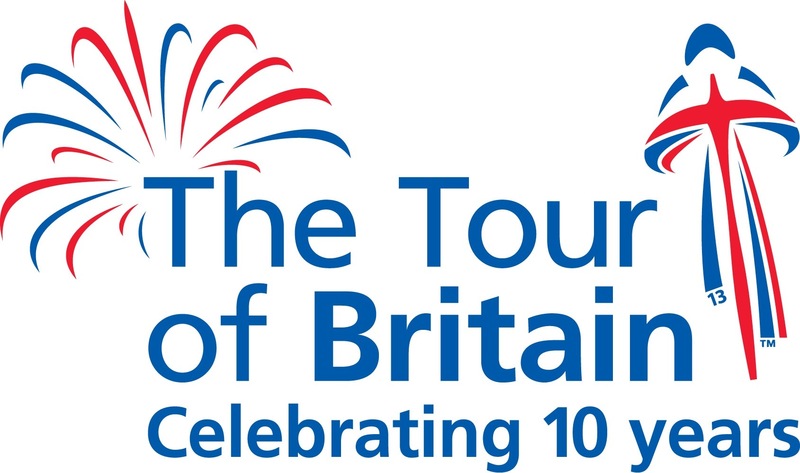 The stage gets underway from the Potteries Museum & Art Gallery in the centre of Stoke-on-Trent at 10:45am. A total of 114 cyclists from 19 teams are taking part in the event. Wiggins won Stage 3, a time trial and now heads the standings ahead of his Sky Pro Cycling team mate Ian Stannard. Tuesday 17th September 2013 – 5.15pm – Chris Kowalik. Two men have been taken to hospital after the car they were in collided with a tree in Warwickshire. West Midlands Ambulance Service was called to Gipsy Lane, Nuneaton shortly before 2.10pm today. A paramedic area support officer in a rapid response vehicle, an ambulance crew and the Derbyshire Leicestershire & Rutland Air Ambulance attended. A West Midlands Ambulance Service spokesman said: “Both men were in their late teens. The driver had a head injury and was immobilised with the use of a spinal board and neck collar as a precaution before being flown to University Hospital Coventry and Warwickshire. Tuesday 17th September 2013 – 4.05pm – Chris Kowalik. 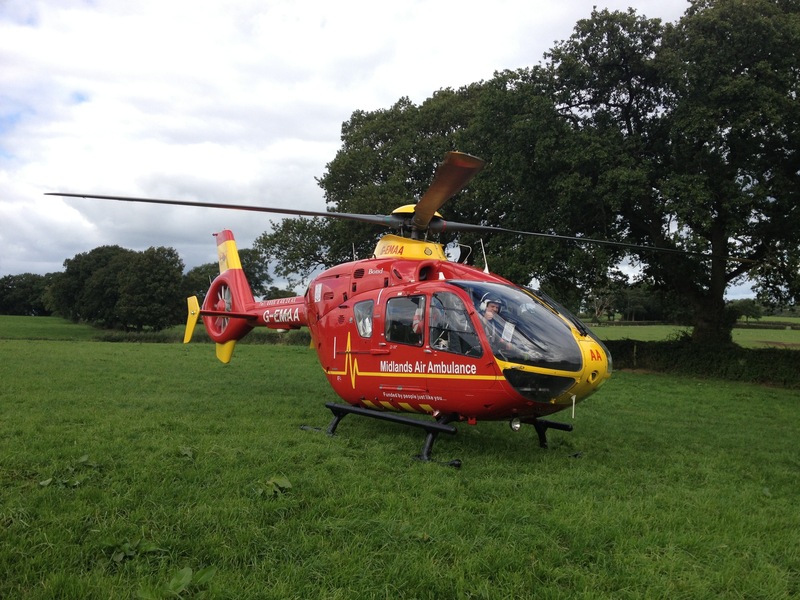 Two women have been flown to hospital with serious injuries following a road traffic collision in north Warwickshire. West Midlands Ambulance Service was called to Mancetter Road, Hartshill shortly after 12.30pm today. The Warwickshire and Northamptonshire Air Ambulance and the Derbyshire Leicestershire and Rutland Air Ambulance, each with a doctor on board, attended. A third doctor attended, arriving in a rapid response vehicle. Also attending were a paramedic area support officer in a rapid response vehicle and four ambulance crews. A West Midlands Ambulance Service spokesman said: “Crews arrived to the scene of a collision involving a car and a 4×4. Both drivers were women. Monday 16th September 2013 – 10.35pm – Murray MacGregor. Youngsters are being warned of the dangers of playing near railway lines after a teenager suffered horrific injuries in the Bilston area. The incident happened where the railway goes under Bayer Street, Coseley at around 6.45pm on Monday evening. An ambulance, a rapid response vehicle, the MERIT trauma doctor and the Hazardous Area Response Team were sent to the scene. A West Midlands Ambulance Service spokesman said: “The 15 year old boy was with a group of friends on some pipework which runs parallel to the road over train tracks. “The crews were told that he slipped down and got too close to the overhead electric cables which then arced onto his left leg, which was set on fire. “His friends managed to pull him back up and put the fire out. They then dragged him roughly 10-15m to the roadside. “The MERIT doctor assessed his potentially very severe burns both externally and internally. He was taken on blue lights to the paediatric major trauma centre at Birmingham Children’s Hospital. Whilst the injury isn’t life threatening, it could be life changing. “We would appeal to people of all ages to be mindful of the dangers of the very high voltages that runs through the electricity cables that run on some railway lines. Monday 16th September 2013 – 11.30am – Claire Brown. A man has been airlifted to hospital after being involved in a collision with a car in Birmingham this morning. West Midlands Ambulance Service was called to the A452 Chester Road near to the Tyburn Island shortly before 8.00am earlier today (Monday). An ambulance, a paramedic area support officer, a responder paramedic and the Midlands Air Ambulance from Cosford with a MERIT trauma doctor on board attended the scene. A West Midlands Ambulance Service spokeswoman said: “The pedestrian, a man in his 40s, had sustained a serious leg injury in the collision. “Crews and the medic administered pain relief to the man, dressed his nasty wound and fully immobilised him with a neck collar and spinal board. The man was then airlifted to Queen Elizabeth Hospital Birmingham, the regions specialist trauma centre, for further emergency treatment. Sunday 15th September 2013 – 8pm – Steve Parry. Seven people have been taken to hospital following a road traffic collision on the M42 this evening. West Midlands Ambulance Service was called to the M42 southbound between junction 11 and 10 just after 6pm. Three ambulances, including two from East Midlands Ambulance Service; a paramedic officer, together with the Midlands Air Ambulance from Tatenhill were sent to the scene. A West Midlands Ambulance Service spokesman said: “Ambulance crews responded to a two-car road traffic collision in which one of the vehicles reportedly overturned and caught fire on the M42. “One male and six females including an 11-year old, all travelling in one vehicle managed to extricate themselves before crews arrived. They were all assessed at the scene by ambulance staff. Four patients were treated for neck pain and three others received minor injuries. “The female driver of the second car involved was assessed at the scene before being released. 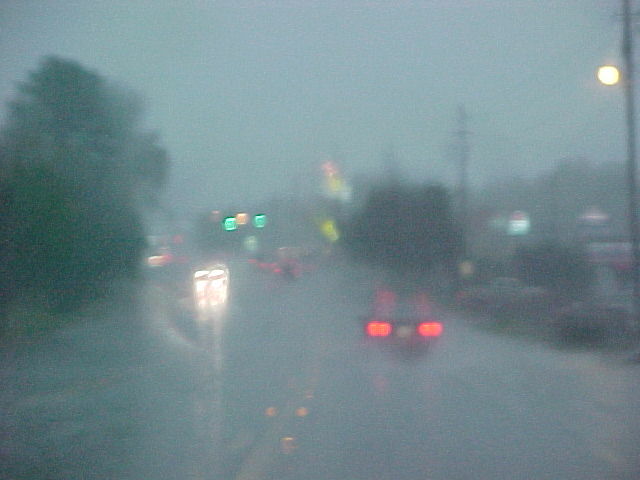 Strong winds and heavy rain approaching. 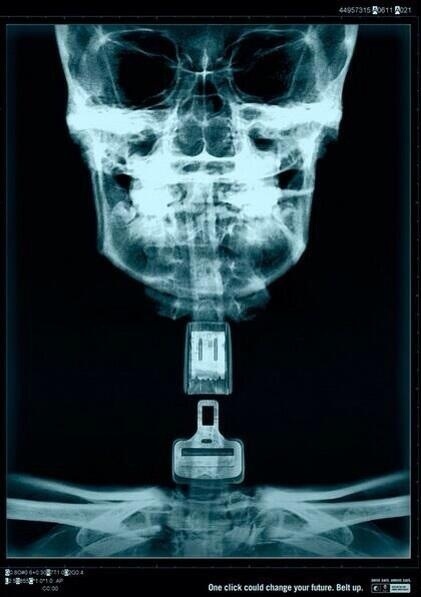 Please drive with extreme caution. Friday 13th September 2013 – 10.15pm – Steve Parry. A woman has been taken to hospital following a road traffic collision in Acocks Green this evening. West Midlands Ambulance Service was called to the junction of Warwick Road and Fox Hollies Road at 9pm. “A woman, believed to be in her fifties, and the driver of the car was trapped in her vehicle. She was released by emergency services and treated for chest injuries. Before being taken to the Queen Elizabeth Hospital the patient was immobilised with the use of a neck collar, spinal board and given pain relief. Friday 13th September 2013 – 2.30pm – Claire Brown. A man has been injured in a road traffic collision in Coventry this afternoon. West Midlands Ambulance Service was called to the Coventry bound carriageway of the A45 in Allesley at around 12.50pm (Friday). An ambulance, a paramedic area support officer and the Warwickshire and Northamptonshire Air Ambulance attended the scene. A West Midlands Ambulance Service spokeswoman said: “Crews arrived to find a car and van which had been involved in a collision. The driver of the car, a man believed to be in his 40s, suffered pain in his neck and back. Due to his condition, the man was carefully extricated from the car with help from the fire service. “The man was fully immobilised with a neck collar and spinal board by ambulance crews before being taken by land ambulance to University Hospital Coventry and Warwickshire for further assessment and treatment. Friday 13th September 2013 – 1.30pm – Claire Brown. An elderly man has been taken to hospital following a road traffic collision in Stoke on Trent this morning. 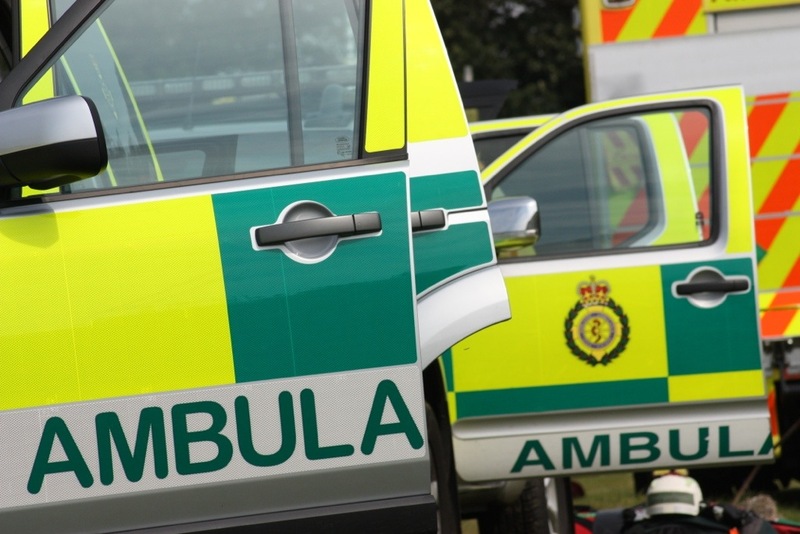 West Midlands Ambulance Service was called to reports of a collision involving a pedestrian and a vehicle on the A34 Stone Road, Trent Vale, at around 7.15am earlier today (Friday). An ambulance, a responder paramedic and a paramedic area support officer attended the scene. A West Midlands Ambulance Service spokeswoman said: “Upon arrival, crews found a pedestrian who had reportedly been involved in a collision with a vehicle. An off duty nurse and paramedic, who were on their way into work, came across the incident and stopped to provide treatment to the man prior to crews arriving. “The pedestrian, a man believed to be in his 70s, had sustained a head injury, a fractured hand and a suspected hip injury. Thursday 12th September 2013 – 3.45pm – Suzie Fothergill. 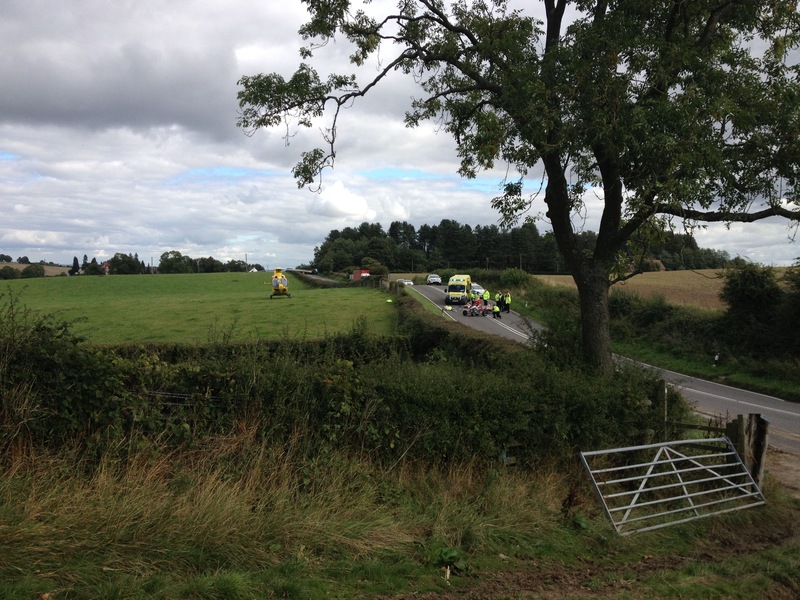 A man has been injured following a road traffic collision on the Shropshire boarder today. West Midlands Ambulance Service dispatched a rapid response vehicle, a BASICS doctor and the Trust’s MERIT team, consisting of a critical care paramedic and a trauma doctor to the incident on the B4393 in Llandrinio at 7.40am this morning. The Welsh Ambulance Service was also in attendance. A West Midlands Ambulance Service spokeswoman said: “On arrival at the scene crews found a single car that had been in collision with a tree. The vehicle had sustained significant damage. Thursday 12th September 2013 – 3pm – Suzie Fothergill. Cycling is more popular than ever. It’s great exercise, it’s cheap and it can cut down on travel time, especially during rush-hour. 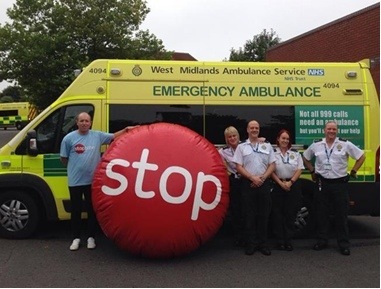 But cyclists are also recognised as a vulnerable group of road users therefore West Midlands Ambulance Service is providing safety advice to those who are celebrating national ‘Cycle to Work Day’ (12th September). Each year the Ambulance Service unfortunately attends to numerous collisions involving cyclists. With cycling becoming an increasingly popular form of transport to travel to work, it is even more important to educate all road users about cycling safety and the need to follow advice to prevent serious injury. Keep your bike well maintained – your brakes should work properly and your tyres should be inflated to the right pressure and be in good condition. It is important to wear the right protective equipment. A good helmet can help minimise injuries and luminous clothing, such as hi-vis vests, fluorscent armbands and reflective belts are also a good idea to help other road users to see you whilst out on the road. Never cycle in the dark without adequate lighting. Make sure you keep to the left. Always look behind and give the proper signal before moving off, changing lanes or making a turn. Follow the rules of the road, never run traffic lights or weave unpredictably in and out of traffic, make sure you stop at pedestrian crossings and don’t cycle on the footpath. 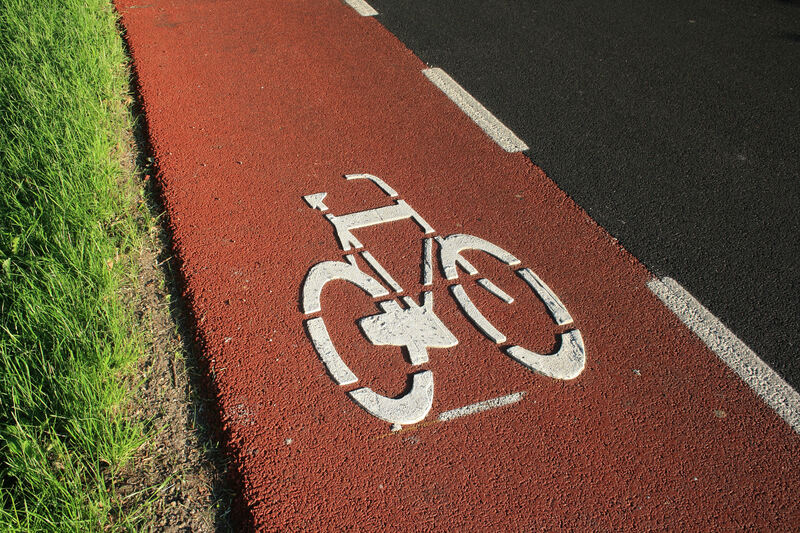 Watch your speed, especially when cycling on busy streets and going downhill. Steer well clear of left-turning vehicles, particularly trucks and buses. Be aware of their blind spots: let them turn before you move ahead. Equally we ask drivers to be vigilant and aware of the cyclist who may be on the road. Always check your mirrors for cyclists before turning and be extra vigilant on roundabouts and at junctions. If approaching a junction and a cyclist is ahead, allow them to pass the junction rather than overtaking and turning sharply across their path. When overtaking give as much room as possible and pass with caution – the highway code states one car’s width. Remember they may have to move over to avoid hazards such as drains, pot holes or debris. Wednesday 11th September 2013 – 11.15am – Claire Brown. 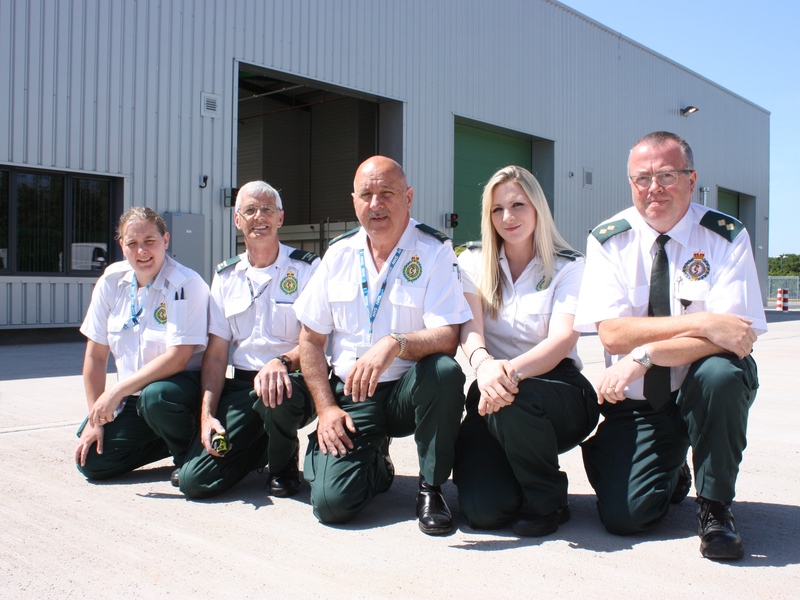 The site, at Hollymoor Point, Hollymoor Way, Northfield, is the home of a new dedicated team of ambulance fleet assistants who clean, stock and prepare ambulances in readiness for clinical staff. It became operational from Tuesday 9th July. It is one of five hubs in Birmingham and the Black Country. Dudley Hub on Burton Road, Willenhall Hub on Ashmore Lake Way and West Bromwich Hub in Hargate Lane are already operational. A further hub in Erdington is due to open later this month. Nathan Hudson, Birmingham General Manager, said: “The new hub is a big improvement on our old traditional ambulance stations on Bristol Road in Selly Oak and Monyhull Hall Road in King’s Norton which were past their best and had been for some years. The hub is fresh, clean and modern with comfortable facilities for staff and plenty of room for vehicles and equipment. “The move into the new hub went well with a few teething problems, typical of a new build, but we’re now fully functional as a hub. This is credit to the work of our management team, excellent planning on their part and all of our staff who have taken the move in their stride. This is a job well done and I would like to thank those involved for their hard work and dedication. “I am confident that the move to the ‘make ready’ system will go a long way in delivering a better environment for our staff and, more importantly, an even better service to patients in Birmingham. The construction of the new hub in Northfield has been done in conjunction with Hortons Estate Developments Limited. 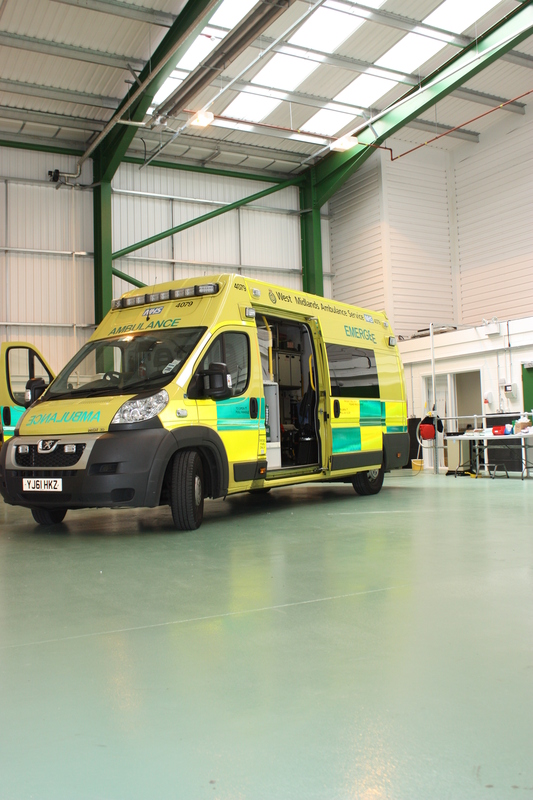 Richard Norgrove, Property Director from Hortons said: “We are delighted to have worked with West Midlands Ambulance Service once more to complete another “make ready” facility. The development has been completed on time and we look forward to our continued association with West Midlands Ambulance Service”. 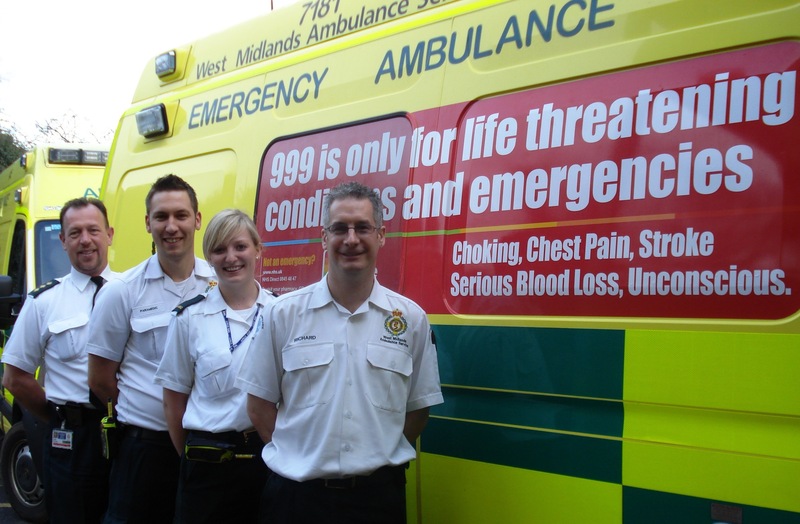 The hubs are a central part of ‘Make Ready’, a project to overhaul and modernise the ambulance service in the West Midlands. 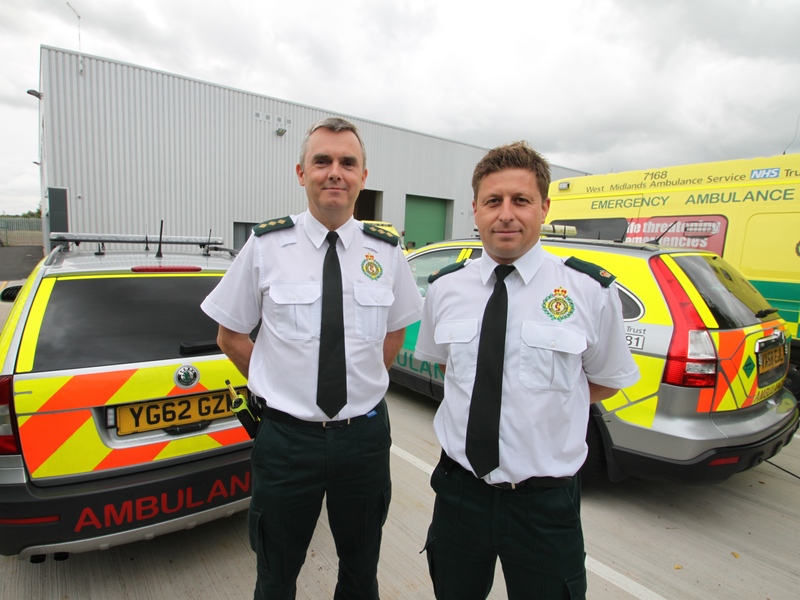 Based on fifteen-and-a-half successful years in Staffordshire, the project involves the creation of new hubs and the sale of traditional ambulance stations. The traditional stations are being replaced by smaller, lower maintenance and lower cost community ambulance stations. 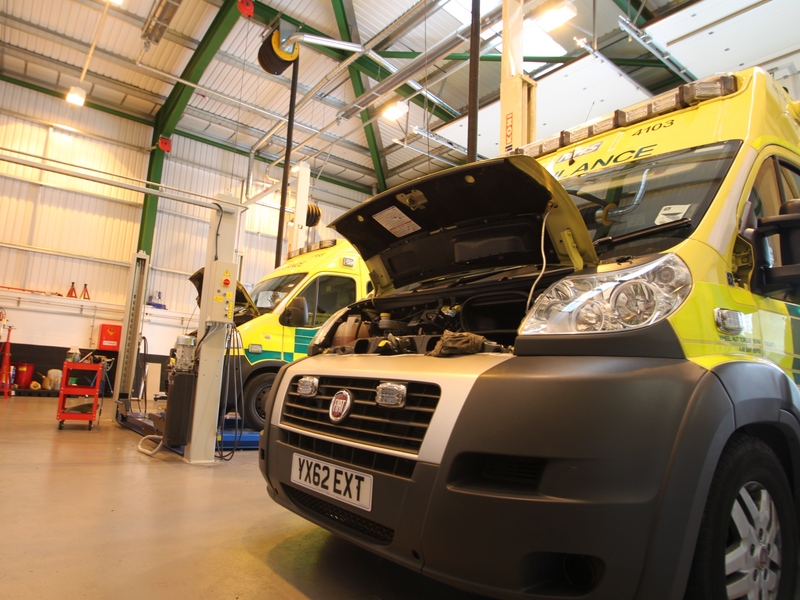 In Birmingham and the Black Country, the number of new community ambulance stations is nearly three times that of the current traditional ambulance stations. Ambulances prepared at the hubs will disperse to community ambulance stations from where they will respond to medical emergencies. The entire ‘Make Ready’ project across Birmingham and the Black Country is due to be fully implemented this year. Photograph 1 (group left to right): Operational staff Carey Phillips, Malcolm Dixon, Ray Lloyd, Kat Hall and Dave Roberts outside Hollymoor Hub. Photograph 2 (left to right): Birmingham South’s Assistant Area Manager Tim Hughes and Area Manager Dax Morris outside Hollymoor Hub. Photograph 3: Vehicle workshop area at Hollymoor Hub. Photograph 4: Outside of Hollymoor Hub. Photograph 5: Make Ready area of Hollymoor Hub. We’ll be tweeting throughout the day. 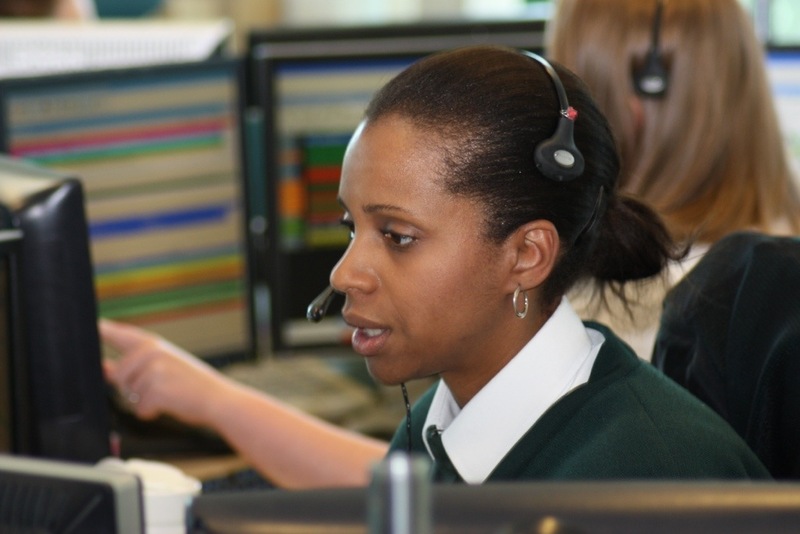 Search for ‘OfficialWMAS’ at http://www.twitter.com for updates. Four patients were treated and taken to hospital after a road traffic collision on the A4014 near Defford this morning. West Midlands Ambulance Service was called to the incident just before 11.10am. Two ambulances; a paramedic officer; a paramedic in a rapid response car and the Midlands Air Ambulance from Strensham attended the scene. A West Midlands Ambulance Service spokesman said: “Crews responded to a road traffic collision involving two vehicles on the A4101 between Pershore and Defford. “The driver of the first car involved, a man in his twenties, was treated for a shoulder injury. “The passenger of the second car involved, a woman in her thirties, was treated for arm and chest injuries. A man in his thirties and a child were treated for minor injuries. 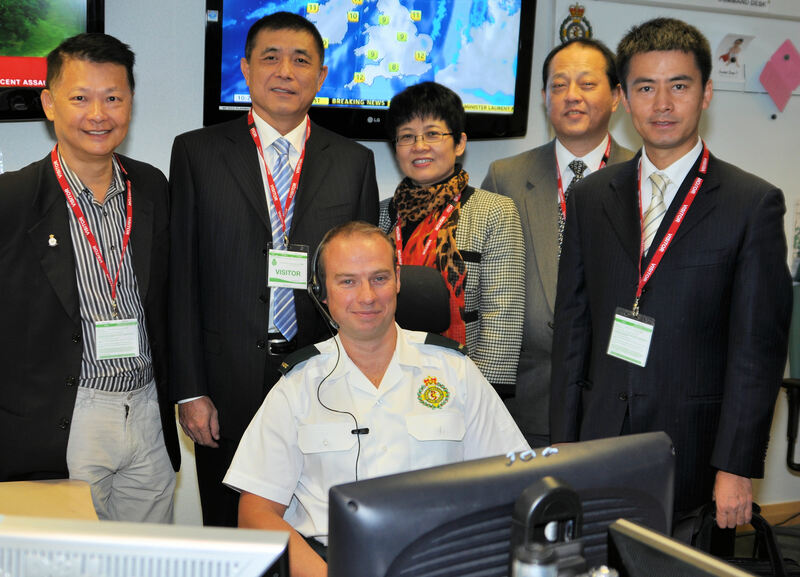 WMAS welcomed a medical delegation from Beijing this morning. Delegates are undertaking a 5-day tour of UK air ambulance operations organised by the Association of Air Ambulances. The dignitaries also visited Strensham air base in Worcestershire as part of their itinerary. 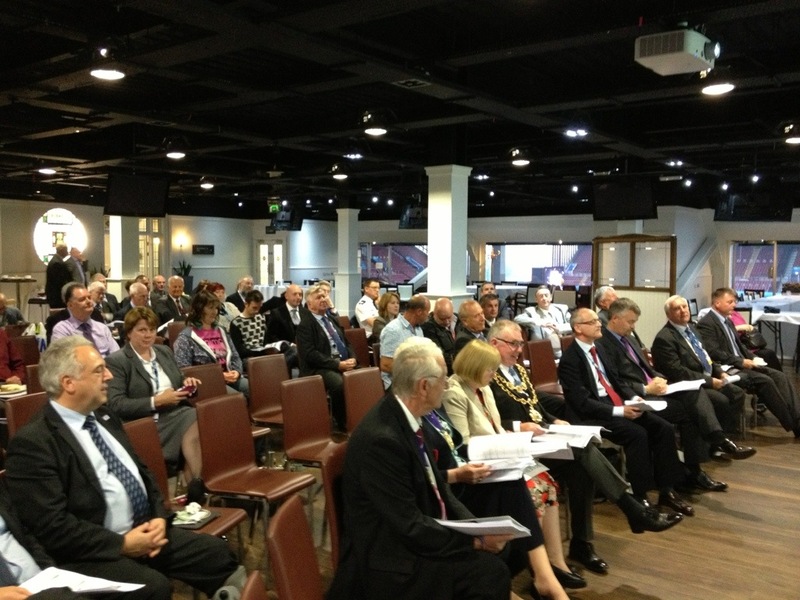 WMAS AGM and Annual Members meeting takes place tomorrow from 6.30pm in the McGregor Suite, Villa Park, Birmingham. Email: kay.cullen@wmas.nhs.uk to reserve a seat.